Some of you may recall my love of Eliot Pattison’s Tibetan mysteries beginning with The Skull Mantra featuring Inspector Shan, a disgraced Chinese policeman exiled to Tibet. Pattison’s use of the mystery genre to convey the beauty and tragic history of Tibet is one of the few series that manages to portray the fierce resilience and compassion of the Tibetan people in the face of annexation and oppression. Pattison is also the author of a series set in colonial America before independence and I was keen to try it. Blood of the Oak is the fourth volume of Pattison’s Bone Rattler series and features Duncan McCallum, an indentured Scot in colonial America. It is 1765 and Duncan, now living in Edentown with his partner Sarah Ramsey and his friend Conawago, a Nipmuc, is summoned by Adanahoe, an Iroquois elder, to investigate the theft of a sacred mask. Having earned their trust and because of his medical training, Duncan is known by the Iroquois as the Death Speaker, a rarity amongst the Europeans. America is in the throes of conflict, a burdgeoning sense of independent identity is forming amongst a small group of influential men and women and resistance is growing against the English and the French who are keen to lay claim to the rich lands held sacred by the Native American tribes. They find themselves caught in the middle, used and discarded by both sides, wary of the Europeans, desperate to protect themselves. When Duncan’s search for the mask leads him to an injured ranger, his friend Patrick Woolford, he realises he has stumbled upon another mystery. When Woolford tells him 19 men have gone missing from Benjamin Franklin’s fledgling communications network including some of his own rangers, Duncan knows they are facing an incredibly clever and terrible foe. For Woolford, like Duncan and the Iroquois, is an expert in navigating the forests. As the powerful elite in England try to cement their control over their wayward colony through the Stamp Tax, Duncan is drawn into the power play that threatens everything he holds dear. As he begins his journey with his friend Tanaqua, a Mohawk, and Analie, a French orphan, to try and prevent the brewing catastrophe, he will come face to face with evil from his past. What is at stake here is not just the lives of those dear to him but the state of the nation itself. But where there is evil, there will be resistance and Duncan finds himself in the midst of those who are willing to put aside differences to fight together for their rights. As well as tackling the complex nature of the different resistance groups supporting the revolutionary cause, the sheer number of people who risked their lives from the Scottish, the English, all the Native American tribes and the African American community, from the freedmen to those struggling under the chains of slavery, Pattison draws an intricate portrait of colonial America and the high stakes involved. The fragility of freedom, the long yoke of servitude and indenture, the indignities, torture and injustice suffered by so many because of the misplaced belief that one race, one people, one class can be better than another is a polemic that is familiar and should still be feared today. And that the only way to overcome the odds is to work together towards a common goal which Pattison shows beautifully. Like his Tibetan novels, Pattison pulls off an intricate mystery while building a world in which historical figures come alive. The complexity of his characters, each with a difficult past, each making their own hard choices, show how tough it was to survive in the new land. And yet within such chaos also lie scenes of stillness and beauty, of the power and sanctity of nature, the importance of belief and worship, and ultimately what ties you to your identity. Pattison excels in creating a story that combines mystery with politics, history and adventure, but what I like best about his novels are his compelling characters. Although some of the characters may be a little too cut and dry, especially the antagonists, Pattison avoids too much stereotyping by including a whole spectrum of characters and he doesn’t shy away from showing the ugly side of society in each community. And like his Tibetan novels, making an outsider, in this case Duncan, the central character makes it work. It certainly sets one thinking about how history and cultures are recorded and by whom. Although this novel could be read as a standalone, I enjoyed it so much that as soon as I finished it, I ordered the rest, Bone Rattler, Eye of the Raven and Original Death. As much as it is a mystery, it is also a love letter to the Native American tribes as well as the exiled Scots who only wanted a place in which to live free. My knowledge of Native American history is pretty much limited to James Fenimore Cooper’s oft-criticised The Last of the Mohicans set in the same period, and reading this has re-awakened my interest. As well as the bibliography in Blood of the Oak, I have Bury My Heart at Wounded Knee by Dee Brown and The Absolutely True Diary of a Part-Time Indian by Sherman Alexie and any further recommendations would be greatly welcome. I would like to thank Eliot Pattison for kindly offering me this book for review. He was right in saying this was a topical and timely read, especially in the wake of recent world events. It would do America and the rest of the world good to go back and re-assess the reasons why people fought so hard for independence in so many countries around the world and that we mustn’t forget that liberty, equality and justice are rights we cannot afford to discard. You can find my review of Mihail Sebastian’s beautiful novel For Two Thousand Years in Issue 9 of Shiny New Books! out today. Please do go and have a look! Tags: Mihail Sebastian, Shiny New Books! Alan Bradley’s seventh novel featuring the magnificent 11 year old chemist Flavia de Luce comes after the satisfying conclusion of a six book long story arc which culminated in the revelation of Flavia’s mother, Harriet’s, fate. This led to Flavia being inducted into some special secrets and what she sees as her ‘banishment’ from her beloved home, Buckshaw, in the lovely English village of Bishop’s Lacey. We start As Chimney Sweepers Come to Dust with Flavia reluctantly on her way to Harriet’s old boarding school, Miss Bodycote’s Female Academy in Canada, to be finished. The night Flavia arrives at Miss Bodycote’s, she is rudely awoken by a fellow student quickly followed by a dessicated corpse that comes tumbling down from her chimney wrapped in the school’s Union Jack flag. The student is taken away in shock but Flavia keeps her cool and secretes a medallion that has broken loose from the grisly corspe before she is bundled away to sleep in the Headmistress’ living room. The incident is played down and yet there are strange rumours of missing girls and ghosts. As Flavia tries to adjust to her new surroundings and get acquainted with her fellow boarders, she begins to suspect that not all is as it seems at Miss Bodycote’s. Her Aunt Felicity had sent her here to learn the tricks of the trade in order to follow in her mother’s footsteps so Flavia knows this school is nothing but ordinary. However, the air is thick with secrets and the Chemistry teacher, to Flavia’s delight, is an acquitted murderer. Will she get to the bottom of the mystery? Whose corpse is it and why does no one speak of the missing girls? As Chimney Sweepers Come to Dust is as delightful as all the other novels in the series. Bradley’s principal characters are so well drawn that I really missed Flavia’s family in England as much as she did. Although there have been some reviews decrying Flavia’s jaunt across the pond, I really enjoyed the rarified and insular air of the girls boarding school which brought back happy memories but with all the twisted friendships and secrets that are part and parcel of boarding school life. Flavia, who normally only has her sisters and the people in her village to keep her company, is suddenly thrust into this new world in which she has to make new friends but be alert enough to know whom to trust. And for someone who likes not to be too noticeable, she is also the daughter of Harriet who is revered like a god at Miss Bodycote’s. All of Flavia’s schoolmates were given interesting names and characters and apart from one niggling point about a missing girl which didn’t seem to be sufficiently explained, the mystery was pretty good. But what keeps drawing me back to Bradley’s creation is Flavia and her family. Flavia’s pluckiness, this time combined with a barely held back home-sickness, just made me want to go and give her a big hug. And what makes reading these books so enjoyable is you can feel how much fun the author is having writing them. I’m already looking forward to the next book in the series. 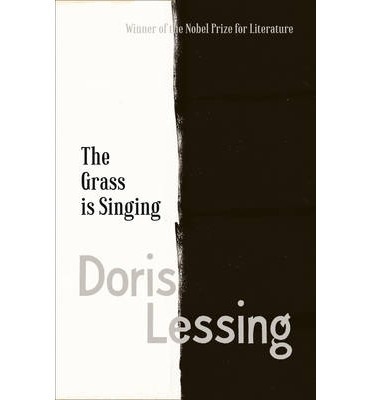 August’s book group choice by Kim was Doris Lessing’s debut novel published in 1950, The Grass is Singing. A Nobel Prize Laureate and author of many novels including The Golden Notebook, I had heard so much about Lessing and yet felt slightly afraid to read her. The Grass is Singing is set in Southern Rhodesia in the 1940s and begins with the murder of Mary Turner by her black servant Moses. In a land where strict racial rules are the means by which the white colonisers maintain their control, any untoward issues that don’t fit in with white society’s ideas of how people should act is quickly and unsentimentally cleared away, untouched. Mary’s murder is cleared as one catalysed by greed. But what Lessing does so beautifully here is to go back in time to find out who Mary Turner was to see why she had to die. And what unravels is a tense, bleak tale of a woman, once happy in her independance and freedom, who is gradually stifled and suffocated by society’s expectations and petty rules. Free at last from her poverty-stricken childhood, a young Mary is living a happy and carefree life in town, working as a secretary and living in a girls hostel where she is never without friends and things to do. She is happy to carry on in this way, having no need for a husband or a house of her own until she overhears her friends ridiculing her behind her back. This sudden shock instigates a paradigm shift in her world view and sets her on a course which she may not have otherwise chosen. She is nothing if not proactive and immediately changes the way she dresses and goes on several unsuccessful dates, making her unhappy and suspicious of other people’s motives. That is until she meets Martin Turner, up in town for the day, a shy, awkward young man who spends most of his time alone working on his farm. Although they feel no attraction to each other, nevertheless, Martin is lonely and Mary needs to get married, and so this happens before they get to really know one another. Mary is happy to leave the town that has soured and Martin is eager to start a family once he has made his farm profitable and has enough money. But life on a farm in the middle of nowhere is far from the life Mary ever envisioned for herself, as is the lack of money. Martin is kind, if not stubborn, but the evergrowing failures of all his ventures quickly grinds down her respect for him. Mary is also uncommunicative and cold and Martin soon realises that his idea of a warm family life may never materialise. And yet the two continue in this vein, Mary slowly succumbing to ennui and depression as the heat gets to her, ever relentless, and her encounters with the natives who work for Martin are fraught with suspicion and trouble. The two are bound together in their wretched house, isolated, and what happens is a slow disintegration of will. Until Moses, one of Martin’s workers, comes to work for Mary in the house. His arrival acts as catalyst, suddenly awakening Mary out of her stupor and bringing up complex emotions that highlights the subtly fraught relations that exist between servant and master, family and friend. And then there is Charlie Slatter, Martin’s neighbour and local kingpin who overseas the social and agricultural goings on in the area. He is the one whom they contact first when Mary’s body is found. He is the one organising and directing the police sergeant who arrives later. And he is the one who makes sure that no extra detail is leaked to the papers. For his duty is to keep the status quo and protect their own. In The Grass is Singing, Lessing binds together a number of important issues; the segregation and treatment of the natives, the unspoken social rules from which you cannot veer and the limited roles within which women can exist in that time. For Mary, she was doomed if she didn’t get married, and she was doomed when she did. What is perhaps poignant is that ultimately both Mary and Martin aren’t exactly bad people. Martin is generally friendly towards his native workers, with a deep understanding of how things work in his country, if not his occupation. Mary starts off carefree, independant and happy, and probably her sole mistake is to get hitched without really thinking things through. What the the pair want are two different things, and because they are gauche and awkward at communicating, are like two cars just missing each other in the fog. Unable to really talk, they just keep diverging in thought and deed. Lessing has created an incredibly nuanced yet striking novel. But there are so many questions which remain unanswered. What exactly was Mary’s relationship with Moses? What at first seemed as though it could have been a forbidden attraction turned out just to be fear. And yet, it was more than that. Charlie Slatter may have tried to tidy the murder as one committed by an angry and greedy servant, yet Moses’ feelings for Mary, although at the end seemed to be of power, had something more. What was it? Mary, though she needed Moses for her survival, much, much more than Martin, could never overcome her fear of him. And Moses, who knew he had power over her, didn’t leave because he knew she needed him. This strange, complex power relationship rings so true because it is pretty much the essence of relationships in its basic form. It stuns me to think that Lessing is able to convey this together with that of a marital couple, friends and neighbours to produce such a layered first novel. And leaving the central question unanswered may have been a stroke of genius. For what remains puzzling is precisely what will stay with you long after you’ve finished. Lessing’s novel is nothing less than a novel about power in its many nuanced form. And she does this subtly and beautifully. The Shinkawas were both irritated and flattered by the Matsugae’s invitation to the blossom viewing. Irritated because they realized how bored they would be. Flattered because it would give them an opportunity to display their authentically European manners in public. The Shinkawas were an old and wealthy merchant family and while it was, of course, essential to maintain the mutually profitable relationship established with the men from Satsuma and Choshu who had riesen to such power within the government, the Baron and his wife held them in secret contempt because of their peasant origins. This was an attitude inherited from their parents, and one that was at the very heart of their newly acquired but unshakable elegance. Reading a novel by Yukio Mishima is rather a daunting prospect as he comes with a lot of baggage, from his highly sensationalised life and death to very divided opinions on his work amongst his Japanese readers. However, what can’t be disputed is his place in Japanese literature. He missed getting the Nobel Prize to Yasunari Kawabata, one he felt was unfair but perhaps inevitable in Japan’s strict hierarchical society even in literary circles, and some say this may have led to his inevitable foray into nationalism and death. But my mother told me many years ago that Mishima’s writing was beautiful and that I must read him. And so I chose him for my book group this summer. 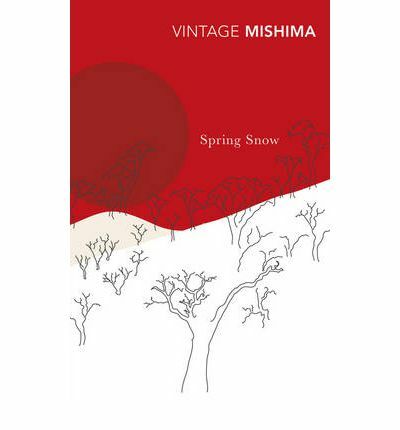 Spring Snow is the first volume in Mishima’s Sea of Fertility quartet detailing the bittersweet love story between Kiyoaki Matsugae, son of a recently elevated Marquis at the Emperor’s court and coming from a long line of Satsuma samurai, and Satoko Ayakura, daughter of a waning aristocratic family, and how it reflects the seismic changes within Japanese society at the beginning of the 20th century. Following the Meiji Restoration, the power structure shifted from the samurai families back to the aristocracy once peace was established. The Marquis Matsugae had sent Kiyoaki to be educated in the Ayakura household and as a result, they no longer have anything in common, Kiyoaki having grown into a rarefied and refined gentleman studying at the Peers School until he is given a position at Court unlike his friend Honda, who has no privileged family connections and is studying to become a lawyer like his father. Into this friendship comes Satoko, Kiyoaki’s childhood friend, a beautiful and self-assured young woman, a few years older than Kiyoaki, who is in love with him. But Kiyoaki has been trained to contain all displays of emotions, fooling everyone around him and ultimately himself. When Satoko’s engagement to an Imperial Prince is announced, Kiyoaki suddenly realises his love for her and is desperate to see her. With the help of Iinuma, his servant, and Tadeshina, Satoko’s maid who has worked for the Ayakuras since before Satoko’s birth, Kiyoaki sets in motion events which will have severe repercussions for both families. This sounds rather grim and there are echoes of Romeo and Juliet here, however, it is Mishima’s style and his beautiful writing that elevates and transforms this tale into something so much more. Here is a microcosm of aristocratic Japanese society, still reverberating from the Meiji Restoration. Satoko, however spirited and intelligent and emotionally so much more mature that Kiyoaki is nevertheless bound by her family and society’s rules and makes the only choice available to her. We see her living, loving and finally realising the true metal of her lover, and although harsh, the choices she makes are the only ones which will set her free. Apart from Satoko, whose only flaw is to fall in love with Kiyoaki, most of the other characters are ineffectual and don’t realise their mistakes until the end. Kiyoaki’s parents are weak and blind to his faults and believe money will solve everything; Honda, Kiyoaki’s friend, tries to help but is too in awe of him; the Ayakuras are living off others and are consequently in a bubble; Iinuma, fanatical and unable to fit into Tokyo life; and Tadeshina, supposedly loyal with a cruel streak inside. Mishima brilliantly depicts the subtle undercurrents within Satoko and Kiyoaki’s circle. The importance of keeping face as opposed to the often ugly side of reality, the obsession with strict rules and manners when real communication between people are lacking and most importantly, intent over-ridden by duty. Both Satoko and Kiyoaki try to break free from their restraints but their methods differ and ultimately fail. There is a tragic sense of miscommunication leaving the reader feeling, ‘if only he had’ or ‘why didn’t he just say something?’ This puts the onus on Kiyoaki, but it’s by no means only his fault. Satoko, who should have known him best failed too. All in all, it’s a glorious piece of tragic storytelling mixed in with cultural and historical detail. Mishima’s knowledge of history and his curiosity of other cultures are evident too. But what really strikes the reader is his mastery of language. His prose is light, whimsical and exquisite. And yet he delves into such dark themes. I loved this book which is so beautifully translated by Michael Gallagher and am looking forward to reading the other novels in the quartet, Runaway Horses, The Temple of Dawn and The Decay of the Angel. I read this as part of Bellezza’s Japanese Literature Challenge 9. Do also check out the reviews by Kim and Tony.